I’m a bit late reviewing this album, it actually already came out some time ago. In spite of the fact that I’m a big fan of Sol Gabetta (I’ve now seen her live twice, once in Lucerne and once in LA) and Cecilia Bartoli is obviously already a living legend, I presume it was the extremely cheesy cover (see below) that put me off a bit initially, and I kind of ignored it. But then, this album ended up being a Gramophone Editor´s Choice, and was highly praised by pretty much every reviewer out there. So I had a closer look. Sol Gabetta is a very talented Cello player from Argentina, who now lives in Switzerland. And does the famous Italian mezzo-soprano Cecila Bartoli really need an intro? So, what do we get here? Most of the album is a mix of Italian and German baroque arias from Albinoni, Händel, Porpora, or Caldara. This may look like a slightly random selection, they were obviously all chosen to ensure the Cello gets appropriately featured. And the result is really very touching. The instrumental backing is Sol Gabetta´s own baroque ensemble Cappella Gabetta, with her brother Andrés as Concert Master. You really are drawn in by the purity and beauty of this album. My favorite tracks is track 5, from Händel´s Ode For Saint Cecilia´s Day. As an add-on, we get a recording of Boccherini´s Cello Concerto. While I kind of like this concerto, I´d actually have preferred to get more of the “duels”. But well, we really can’t complain, this is a beautiful album throughout. My rating: 4 stars (5 star playing throughout, I’m just not a particular Boccherini fan). I haven’t written that much about Händel yet. My index (you can find all blog post in relation to any composer on the right, or just do a free text search) shows only 3 articles. Namely, his opera Rinaldo, Christie’s exciting album about Music For Queen Caroline, and, obviously, the Messiah. This may indicate a lack of interest. Well actually, not at all, Händel is my second favorite baroque composer (JSB takes first place by a large margin). My “problem” with Händel is that his true masterworks are his operas and oratorios, all of which are quite long, and require quite a long attention span, and time that I don’t always have. But then again, there truly are pieces that are worth checking out. Let me write about one of the first I really fell in love with. Il Trionfo Del Tempo E Del Disinganno was Händels very first Oratorio. I’m not sure you really care about the story. I do speak some Italian and am able to follow, but honestly, like with many of the rather confusing stories (to me) of the baroque operas, you basically have personified Beauty, Pleasure, Time and however you best translate disinganno (probably somewhat around “disillusion”) about their relative merits. The story ends with beauty being frustrated and wanting to become a nun. So in a nutshell, never mind the story, but just enjoy the outstandingly beautiful music. Emmanuelle Haïm, a French cembalo player, has established herself as one of the leading conductors of baroque music over the last 15 years. She had some great mentors having worked with William Christie and even Simon Rattle. She founded her own baroque ensemble, Le Concert d’Astrée, in 2000. I’ve already written about her outstanding Messiah, and a very beautiful Mozart c-minor mass with Louis Langrée and the same ensemble. But obviously, an oratorio not only needs outstanding orchestral playing, but also beautiful voices. Nathalie Dessay is truly one of the best baroque singers ever, and Ann Hallenberg and Sonia Prina are of outstanding beauty as well. One track to look out for is Lascia La Spina, the original version of Lascia ch’io pianga, already mentioned in my post Top 10 Music That Gives Me Goose Bumps. Again, as mentioned above, you are in for nearly 2h30 of music here, but it is worth taking the time for it. In my post some time ago on The Top 10 Music That Gives Me Goose Bumps, I mentioned the famous aria “Lascia ch’io pianga” (Let me weep). Rinaldo, as its HWV number of 7 indicates, is one of the earlier Händel works, but in spite of this, Lascia is what we’d call recycling today, as it has been used twice before in other works, once without words in his op. 1, the opera Almira (rarely played these days), and also in the oratorio Il Trionfo Del Tempo E Del Disinganno (which in spite of its HWV number of 71 is also really early, but was reworked). This kind of recycling in the baroque area was very common, even Bach used it all over the place, by the way. Many cantatas all over sudden will remind you of the Christmas Oratorio, or have a piece of the Brandenburg concertos. But back to Rinaldo. This was probably the first of his London operas. The story, is based during the first crusade near Jerusalem, and based on an epic by Torquato Tasso. In spite of the great success of Lascia, the entire opera hasn’t been recorded that often. These days you basically have the choice between three versions (plus some DVD editions). The oldest one is Jean-Claude Malgoires 1977 recording on Sony, still quite nice. The to more recent ones are René Jacobs that I haven’t written about a lot yet, and Christopher Hogwood, both from the first decade of this century. Between the two I have a preference for Hogwood, thanks to its outstanding cast, in spite of the fact that Cecilia Bartoli sometimes is a bit heavy in terms of vibrato (I prefer the cleaner singing of the modern “historically informed performance” style). This recording should be on every collectors shelf (or these days more likely, hard drive). My rating: 4 stars (as beautiful as it is, I still think this can be bettered in a future version). When I was younger, I was very snobby towards Best Of or “Highlight” versions of operas, I always wanted to get the full opera. With operas of the classical period, I’m still that way, however, for baroque opera, that are usually very long, have rather complex and/or weird stories I must admit I don’t always have the patience for 3h plus of Opera seria. Luckily you’ll find the most popular (and outstandingly beautiful) arias of Händel et al quite often on recital albums by individual soloist. Let me recommend two very beautiful ones here that feature Lascia, by Patricia Petibon and Simone Kermes, respectively called Rosso and Drama, and both highly recommended. They offer an excellent entry into baroque opera. I’ve already mentioned before that my personal ranking of Baroque composers is Bach first, Händel is second. So let me write about no. 2 on the list. Händel is German, although he spent quite a bit of his professional life in London and is somehow adopted English, so probably you’re more familiar with the George Frideric spelling of his name. If you ask the average guy on the street whose typical musical fare is contemporary pop music, chances are he or she has at least heard a couple of ultra-famous classical pieces. These often include the “Da-da-da-daaaa” from Beethoven’s 5th, Bach’s Toccata BWV565 etc. etc.. Somebody even bothered to compile a top 10. Not surprisingly, this top 10 list includes our friend Georg Friedrich (sorry, I’ll stick to his birth name). Guess which one it is? Obviously: “Hallelujah” from the Messiah. I’m not such a big fan of the Messiah, it’s good, but I can only listen to it ever so often. But it summarizes one of the two things Händel does really well: Glorious Oratorios, often with festive character. His two other rather well-known pieces, the fireworks- and water music, are of similar character. The other thing Händel is really great at, is related, amazing stage drama. His Baroque operas and oratorios (many oratorios are actually operas, but weren’t allowed to be called opera as the pope Clement XI had some issue with this form of entertainment). I’ll certainly post more about the baroque operas later. Back to the festive music. Obviously key clients for composers at the time were royals, and royal festivities like the arrival of a new queen, the coronation, or even funerals, required the appropriate musical soundtrack. 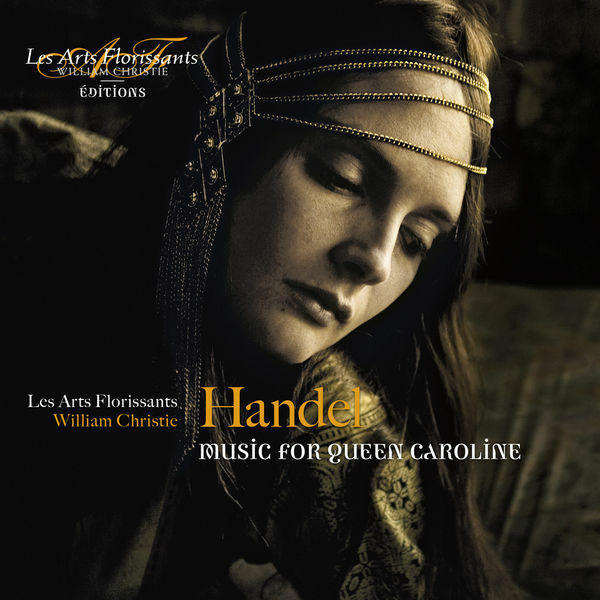 This album from William Christie and his Les Arts Florissants ensemble from 2014 brings you all three. Like many others, William Christie, the American turned French conductor has created his own label for this release. By the way, usually you can buy most of Christie’s releases blindly, he’s rather ever done a bad album and many are outstanding. His Messiah is still my personal reference version. You’ll get three oeuvres on this album, all related to Queen Caroline (another German in the long history of German blood in the British royal family by the way): The Coronation Anthem, a Te Deum that was even nicknamed after her, and her funeral music. All three are just outstanding pleasure to listen to, and William Christie does an amazing job here. This is 1h12 packed with emotions, with very little time to relax. Furthermore, this album is very well recorded, which makes the impact on a good stereo even stronger. (this is one potential 5 star candidate, but I’ve only acquired it recently and need to give it some more spins before making u p my mind). Update Oct 2016: I’ll stick to the 4 star rating. It is really nice to have but not essential. What is your favorite piece by Händel?